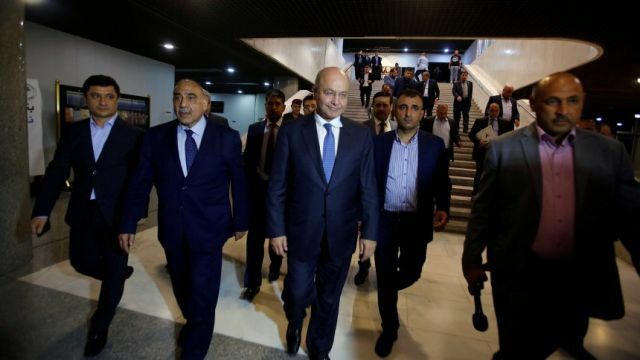 Baghdad : Iraqi lawmakers have elected Barham Salih as the new president of Iraq after a protracted political wrangling, marking a crucial step in forming the government in the next four years. Salih gained 219 votes out of a total of 272 lawmakers who cast their votes on Tuesday in the second round of voting, advancing on his rival Fuad Hussein who gained 22 votes in the session, Xinhua news agency reported. In the first round of voting, any of about 20 candidates, who were competing for the president post, had failed to win the two-third of the total 329 parliament members needed for the post. But Barham Salih gained the highest votes 165, while Fuad Hussein came in the second place with 89 votes out of about 300 lawmakers who cast their votes in the first round. According to the Iraqi constitution, the president-elect needs to gather at least two thirds of the votes of the 329 parliament members. If the parliament lawmakers fail to vote by a two-third majority, the two candidates with the highest number of votes shall compete with each other. The one receiving the majority of votes in the second round of vote shall be declared the president of Iraq. “I will be the president of Iraq and not for a certain group, entity or component,” Salih pledged. Afterwards, the Parliament Speaker Mohammed al-Halbousi adjourned the session to next Tuesday. According to the constitution, Salih will have 15 days after taking office to task the nominee of the largest alliance to form the government of the next four years. The Iraqi media reports said that the independent politician Adel Abdul-Mahdi will be the nominee of the largest alliance, after the contesting two alliances who previously claimed they were the largest alliance reached a consensus that they both nominated Mahdi as their candidate for the next prime minister post. Barham Ahmed Salih, 58, is a veteran Kurdish politician, born in the city of Sulaimaniyah in northeastern Iraq. He was former prime minister of Iraq’s semi-autonomous Kurdistan from 2001 to 2004. Later, he became deputy prime minister of the federal government and occupied many ministerial posts in Baghdad and Erbil in the last 15 years.